Some cricket players know how to bat well, some have mastered that perfect “inswing”, some take jaw-dropping catches, while some are all-rounders. In my opinion, bloggers are also all-rounders. Blogging is an activity that requires multiple skills/talents. Not many people realize this, especially in India, but, it’s a fact. Here’s a brief list of skills that make up an average blogger’s arsenal. ‘Coz we’ve to participate in those “Photo A Day” challenges too, no! And we’ve to share our recipes, our art-work, pics of our babies, and yes, our pets and plants too! While not a necessity like the above points, a working knowledge of web designing adds a lot to the visual appeal of our blogs, and some of us have acquired varying degrees of web-designing skills since our foray into blogging. So these are a few skills that are present in a blogger’s arsenal. Besides these, we’re all hard-working people. We’re dedicated and disciplined. (Ok, most of us are!) And we've all learnt how to manage time between our work, family, other hobbies AND blogging! Do you guys agree? Which of these skills are present in your blogging arsenal? Which one would you love to add the most? Would you like to add anything to this list? 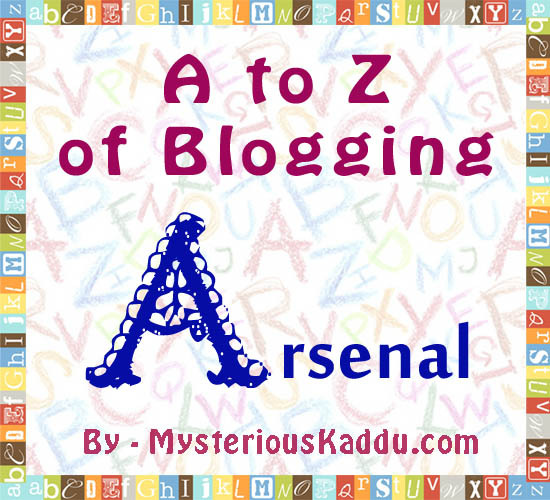 This is my first post for 2015 AprilAtoZ. Yep...all very valid points. Wish I had better web designing skills though! 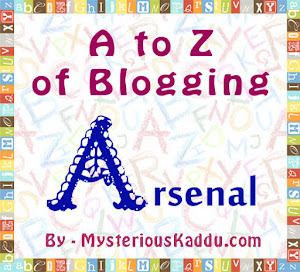 will be following your A-Z Have fun! Cheers! Oh yes, I agree, we need many things in our arsenal! Great theme, I can't wait to read more posts! Kaddu -- Good points! I love your unique letter A. @Sanch: And I wish I had better networking skills! Sighhhh! Thanks for stopping by, Kathe, and for sharing your post URL too. :) Made it so much easier for me to check out your blog. Cheers to you too! Lovely beginning...and i guess u have covered it all! !